Home » Social Commentary » It is inappropriate for teachers to wear that shirt. It is inappropriate for teachers to wear that shirt. I remember an old colleague once telling me that it was our job to educate the future generation, and therefore it is appropriate for teachers to impart wise political perspective to students. Of course, this was code for promoting a world view that champions opinions usually associated with the political Left: multiculturalism, free market skepticism and cultural-identity politics. 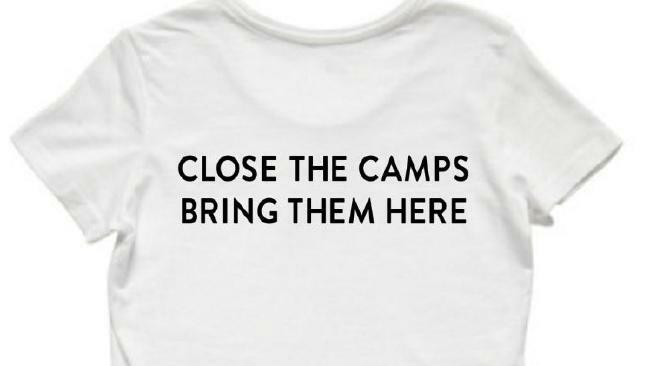 I was reminded of the conversation this week when media reports revealed that a group of teachers plan to wear pro-refugee t-shirts in classrooms over the next week. Again, I am troubled by the increasing tendency of some teachers’ inability to dissociate their personal politics from their classroom practice. It can be difficult to objectively approach issues in the classroom when one holds views they see as unambiguously morally right, but what needs to be remembered is that individuals hold different values systems that inform how they see the world, and the teachers parading the shirts this week seem to overlook this. I have no doubt that they feel a strong personal responsibility to stand for what is right, but that question of what is right is a philosophically complex one. What if a teacher holds a libertarian outlook on the world, one that advocates for lower taxation and limited government intervention in our lives? The American Declaration of Independence champions the right to liberty and the pursuit of happiness as self evident. One might interpret this as a universal truth that one should be free from any form of government control. Therefore, what can be said if a teacher wishes to wear a ‘pay no tax’ shirt in the classroom? What if one’s value system is informed by a close affinity to country and its sovereignty? They view themselves as patriots for Australia, and in their mind the authority of Australian law usurps any international obligation towards refugees. Is it therefore acceptable that they wear a ‘stop the boats’ shirt around the school corridors? In each case, the individual teacher is standing for what they believe is right, but the obvious truth is their ‘right’ is contestable, vulnerable to counter-arguments and intellectual debate. This is the unfortunate oversight of the shirts issue. Rather than accepting a ‘close the camps’ argument as universally right, the teachers concerned should be using the issue as an opportunity to teach students about developing their own view, rather than having it formed for them by an individual abusing an uneven balance of power in the room. It is the responsibility of teachers to educate students about different values systems and outlooks on the world, encouraging them to inquire into the validity of various perspectives. It is unfair to only offer a narrow prism from which to approach issues. The current debate over the Australian history curriculum is a case in point. There is a growing push for educators to use the term ‘invaded’ rather than ‘settled’ in regard to 1788. Victorian Aboriginal Education Association general manager Lionel Bamblett said that he would prefer to see the term invasion in the curriculum. In March, Queensland Premier Annastacia Palaszczuk said that Australia was invaded and schools had been lying to students for too long. Any campaign to necessitate the use of one term over another, instead of asking the students to develop their own view as to the merits of the term ‘invasion’ or ‘settlement’, misses the point of education entirely. As teachers, we are there to invite students to develop an interpretation, rather than preach one to them. This is why the shirts are inappropriate. They do not serve any purpose other than to preach a political view. Lucy Honan, a co-founder of the Teachers for Refugees group, has accused Victorian Education Minister James Merlino and federal counterpart Simon ­Birmingham of infringing on her rights by “telling us we cannot express our views”. Honan is free to express her views, but not in the confines of the classroom. If she wishes to hold a class discussion on the merits of offshore detention, or invite the students to research into the merits of different policy approaches, fantastic. Yet just wearing the shirt invites the students to accept her view as the only one on offer, and students deserve better.